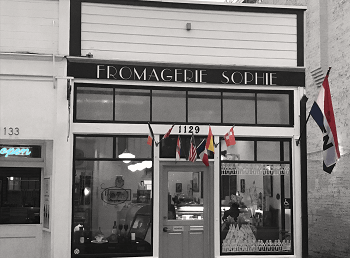 Walk into Fromagerie Sophie, and you’ll be transported from San Luis Obispo to a neighborhood Paris cheese shop. Once you step over the threshold and into Fromagerie Sophie, a little shop on tree-lined Garden Street in downtown San Luis Obispo, you enter another world: your neighborhood fromagerie in your hometown of Paris. Along with Époisses de Bourgogne, Langres, Tome des Pictons, and more from France, your eyes take in the rows of Gorwydd Caerphilly, Chiriboga Obre Mu Blue, Fior Di Noce Stagionato, and Schnebelhorn from England, Germany, Italy, and Switzlerland, plus dozens more cheeses that fill the cases. Between 60 to 80 cheeses from around the world fill the cases. But there’s so much more than cheese inside this shop. 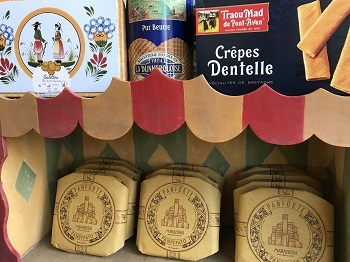 Beautifully displayed throughout the store you’ll find accoutrements—the jams, quince paste, dried fruits, nuts, crackers and other foils that increase the enjoyment of cheese—plus tasteful gifts. The most satisfying ingredient, however, doesn’t come in a wrapper or container. The best part is the warm feeling of welcome that envelopes the store and everyone in it like the carefully wrapped packages of cheese that Sophie, Paul, and her staff tuck into customers’ hands as they make their way home to later share this cheese with friends and family during quiet moments and simply enjoying time together. While it may look like Fromagerie Sophie is in the business of selling cheese, it uses cheese as the perfect backdrop to offer something more special: the reminder of the important things in life. Slow down, enjoy time with people you enjoy, savor the moment. Like a good cheese, Fromagerie Sophie took time to create. In fact, “cheese shop owner” wasn’t originally on the short list of career options for Sophie Boban-Doering. She grew up in the Bay Area and attended college in Austin, Texas. There, she worked in a software company and pursued her training as an amateur triathlete. “A lot of my friends were fire-fighters,” said Sophie, “The more I learned about their work, the more it intrigued me.” She loved the idea of helping people and being of service. Plus, as a triathlete, the physical aspects of fire-fighting appealed to her. A variety of clubs and special events encourage clients to explore the world of taste found at Fromagerie Sophie. While exploring how to get involved with fire-fighting, she learned that Austin had age limits for new enrollees to the fire academy. She was just outside the range; for now, this dream would have to wait. In the meantime, her job at the software company ended. When a friend casually mentioned she was moving to San Luis Obispo and asked if Sophie like to go with her, the answer was a quick and simple yes. 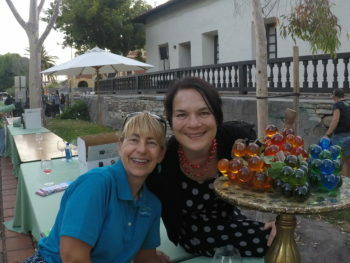 In 2003, Sophie and her friend packed up and headed west to settle in San Luis Obispo. After she arrived, she enrolled in the Allan Hancock College fire academy. After graduation, she spent two years as a reserve firefighter with Atascadero Fire. Work, triathlon training, and being a fire-fighter reservist filled most of her time. “I was happy, but my friends kept telling me I needed to get out and date more,” she laughed. “They suggested I try online dating.” One experience stands out as particularly bad, and she vowed never to do that again. While she loved being a reserve firefighter, Sophie began to realize that it likely was not going to become a long-term career. Instead, she began a nursing program, where she met fellow student Paul Doering. Originally from San Diego, Paul had majored in Applied Math at Cal Poly. “I knew I wanted to stay in San Luis Obispo,” said Paul, and he found a great job using his math expertise. It wasn’t long before their long conversations and laughter led to marriage. While the opening of Fromagerie Sophie was still a few years off, a trip to Paris to celebrate Paul’s birthday over Christmas and New Year’s started the idea percolating. Accoutrements—jams, quince paste, dried fruits, nuts, crackers and other foils that increase the enjoyment of cheese—are beautifully displayed throughout the store. After they returned to San Luis Obispo, Sophie and Paul walked the downtown streets, reminiscing about their trip. What was it they missed most? What did they wish their own town had that was like Paris? At the time, Sophie and Paul were considering moving to Austin or Petaluma to be closer to family. “What would it take for us to not leave for five years?” they asked themselves. They valued interesting things to do, cultural activities, and special places to eat, like the Utopia Bakery. Now closed after the original owner sold it, it created an atmosphere that drew scores of customers based on top-quality ingredients, freshness, and a welcoming feel. It also brought in local musicians and entertainment, providing more than great German family recipes for baked goods. As Sophie and Paul walked and talked, the topic eventually centered on cheese—those fabulous French cheeses. They missed them; they yearned for both the taste and the experience of trying new French cheeses while sitting outside neighborhood fromageries. “We realized it was more than just the product of fine cheeses that we wanted to bring to SLO,” said Sophie. They wondered… could we open a fromagerie here? Would it work? Would people find it as enjoyable as we enjoyed the Paris fromageries? Once they found the shop space, they started designing Fromagerie Sophie from the ground up. Sophie’s experience in the frozen fruit industry was perfectly aligned. She used that knowledge to contact cheese makers around the world and being importing cheese. 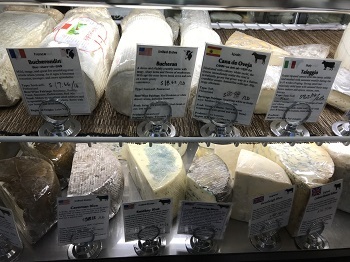 Sample cheeses from England, France, Germany, Italy, Spain, Switzerland, Holland, the United States, and other countries, with new selections added regularly. It’s not just the quality cheeses and other products that have created such a strong following for Fromagerie Sophie. The intangible quality that infuses the shop was formed during Sophie’s childhood. Take time. Enjoy the experience of sharing with family and friends. Slow down. Enjoy life. Really talk to people, listen, and discover their needs and wants. “I knew this is the feel we wanted to have in our shop,” she added. Sophie inherited this ability, and it’s shared by Paul and team members Danielle and Faeth. 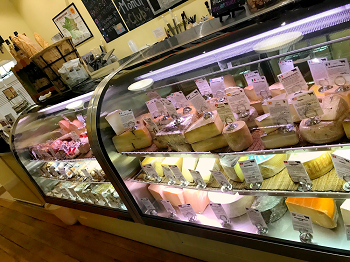 Attend any event where Fromagerie Sophie is serving or participating, and you’ll see a long line of people waiting to get a taste of this welcoming feel along with the fine cheeses. If you go wine tasting at many Central Coast wineries, from San Luis Obispo to Paso Robles, you may well be offered a cheese-pairing plate created by Fromagerie Sophie to elevate your tasting experience from merely sampling wine to creating a memorable event. While this is now a large, and visible, part of their business, it came about from a chance phone call. “Erin, the tasting room manager at Kenneth Volk, called one day and asked if we could create cheese plates,” recalls Sophie. Fromagerie Sophie regularly attends the SLO Wine Country “Barrels in the Plaza” event at the San Luis Obispo de Tolosa Mission. That lead to more opportunities, and they continued to look for ways to connect with more people, from the Sunset Savor the Central Coast event to the SLO Wine Association’s popular annual Roll Out the Barrels event, including the kick-off Barrels in the Plaza tasting event at the San Luis Obispo de Tolosa Mission, and more. Over time, more wineries inquired about offering cheese plates. Today, Fromagerie Sophie provides cheese pairings to more than 30 wineries. Like at the shop, the success of the program is grounded in personal service and setting high expectations of quality. Fromagerie Sophie also works with wedding organizers and caterers. One of their new items is their signature Cheese Cake, rounds of cheese plated and decorated to look like a luscious buttercream-iced wedding cake, but made of different cheeses. 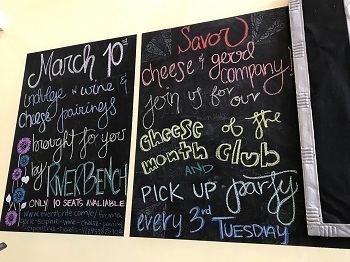 They also co-host cheese-pairing events, such as the hard cider and cheese pairing event with Bristols Cider House in Atascadero and a wine and cheese pairing event at WineSneak in San Luis Obispo. 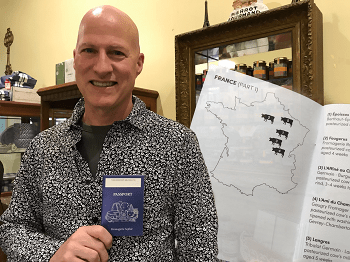 The Fromagerie Sophie Cheese Passport program leads you on a tour of the world’s great cheeses. To help clients discover even more, they created the Fromagerie Sophie Passport Program. Each time you buy a new cheese, your passport is stamped. When it’s full, you’ll garner a gift and recognition as a global cheese expert. They also have several clubs (Cheese of the Month, Charcuterie, and Gourmet Goodies) to satisfy a range of tastes. Just like good cheese takes time to ripen, Sophie and Paul continue to evolve the shop. 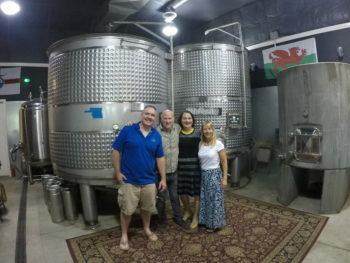 Sophie and Paul continue to evolve and explore ways to share Fromagerie Sophie with the community, such as this hard cider and cheese pairing event at Bristols Ciderhouse in Atascadero. It’s all part of the adventure, the growth, and their commitment to never be complacent. Their goal is for Fromagerie Sophie to be a destination for the best cheeses, as well as the experience and the learning that go along with it. “We want to give people who visit the same level of experience they’d find in a great French restaurant—amazing service, no pressure to rush, and taking the time to talk with people and hear them,” said Sophie. 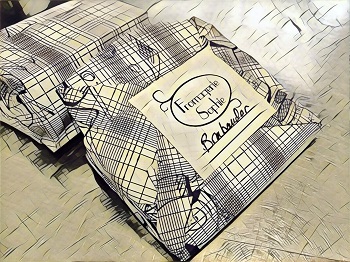 When you visit Fromagerie Sophie, you’ll likely come out with a few lovingly wrapped packages of cheese. Inside each package, you’ll find a bit more than just great cheese. Because cheese isn’t just milk—aged and wrapped up in a rind or a wax or a coating of mustard seed. Cheese represents the opportunity to slow down, enjoy special times, create memories, and let go of hurry and worry. Like life, it’s often circular, meant to be savored, enjoyed, and relished along with the company of those who share it. Inside each hand-wrapped package, you’ll find a bit more than just great cheese…. Fromagerie Sophie offers some of the best cheeses in the world. Here are a few tips to get the most enjoyment from your tour of the world’s tastes. Temperature. A rule of thumb is that quality cheeses are best at room temperature. Leave the cheese out for about 30 minutes if possible before enjoying. Go solo. We don’t mean eat only one cheese at a sitting, but rather to enjoy the cheeses on their own instead of melted over a dish, sandwiched between hearty bread, or stacked on a savory cracker. Instead, try a bite of cheese and savor it. Bread and crackers are good palate cleaners and sometimes necessary for eating gooey cheeses. But overall, let the cheese be the centerpiece instead of the condiment. To rind or not to rind? Unless the rind is made of plastic or heavy wax, try it! The flavor, and sometimes consistency, of a cheese can differ the closer it is to the rind. The rind is made to be eaten and enjoyed. Pairings. Quality cheeses are not usually paired with food, but they may paired with accoutrements – a jam, quince paste, a bit of salami, to bring out the best of the cheese. Wine pairing. Pairing cheese with the right wine can result in delicious discoveries. Ask for recommendations, or consider pairing a wine and cheese from the same region. See the related sidebar for a few classic wine and cheese pairings. Order. Like a wine tasting, it’s helpful to enjoy the lighter or more subtly flavored cheeses before moving to the robust and strong cheeses. Etiquette. There’s a human temptation to eat just the middle from an Oreo cookie and the middle from a soft cheese, leaving the outside untouched. Paul calls this “tunneling,” so do your best to not make this cheese faux pas. Explore. With about 2,000 cheese made around the world, have fun trying new tastes and textures. You may just discover a new favorite. Enjoy. There are no right or wrong answers when it comes to choosing cheese. Let taste be your guide and enjoy the experience. The Flavor Team wants to thank Sophie and Paul and the team at Fromagerie Sophie for sharing your time and your passion for all you do.